Τοποθετημένο στην καρδιά της Τσατουχακ, το A Hostel Bangkok είναι το ιδανικό σημείο από όπου μπορείτε να ανακαλύψετε τη Μπανγκόκ. Το ξενοδοχείο βρίσκεται 6.4 KM από το κέντρο της πόλης και σας προσφέρει εύκολη πρόσβαση σε σημαντικά μέρη της. Με την βολική του τοποθεσία, το ξενοδοχείο προσφέρει εύκολη πρόσβαση στους προορισμούς της πόλης που πρέπει οπωσδήποτε να δείτε. Οι εγκαταστάσεις και οι υπηρεσίες που παρέχει το A Hostel Bangkok διασφαλίζουν την ευχάριστη διαμονή των πελατών. Κατά την διαμονή σας σε αυτό το υπέροχο ξενοδοχείο, μπορείτε να απολαύσετε τα δωρεάν WiFi σε όλα τα δωμάτια, φύλαξη αποσκευών, ασύρματη σύνδεση Wi-Fi σε δημόσιους χώρους, χώρος στάθμευσης οχημάτων, υπηρεσία δωματίου. Το ξενοδοχείο διαθέτει 18 όμορφα διακοσμημένα δωμάτια, πολλά από τα οποία περιλαμβάνουν κρεμάστρα ρούχων, θυρίδα, καθρέφτης, παντόφλες, πετσέτες. Εξάλλου, το ξενοδοχείο διοργανώνει πολλά ψυχαγωγικά δρώμενα έτσι ώστε να έχετε πολλά πράγματα να κάνετε κατά τη διαμονή σας. Το A Hostel Bangkok είναι μια έξυπνη επιλογή για τους ταξιδιώτες στη Μπανγκόκ προσφέροντας κάθε φορά μια ήρεμη και ήσυχη διαμονή. This is my 2nd time staying here, everything is as good as last time. I will stay here again if I travel to Bangkok. Really nice hostel in a quiet area. However, the private rooms have cheap doors and you can hear everything in the hallway. Can get loud at times since it was close to the main stairs that everyone uses. I would still stay here again. clean room and well-equipped common area. friendly staff. artsy space. with enough parking space for guests with cars. the only problem is that if you have a big luggage/heavy stuff, there is no elevator. Nice hotel, friendly staff and nice and helpful staff, also hv a cute cute dog name Gopi (Coffee in thai) Happy stay here, just abit disappointed same room with selfish room mate, keep higher the aircond to 26cc with lower fan (even i try to lower to 24cc and she higher aircond again and again) , not care other user. and whole night keep sweating until morning. Hope next time will have a nice room mate and we will visit again next yrs . Great spot for overnight. Extremely nice & helpful staff. Highly recommend specially if look for a very basic room, and you take a bus early morning day after from Mochit. Value for money. The hotel I had booked with accidentally rented out their last private room, so they took me here. It was a very updated, but basic accommodation. Nothing too exciting for what I have stayed at for the same price in Bangkok, but it was quiet and clean, so I can't complain! The staff was very accommodating and woke up early to ensure I had a taxi to the airport. Thank you! 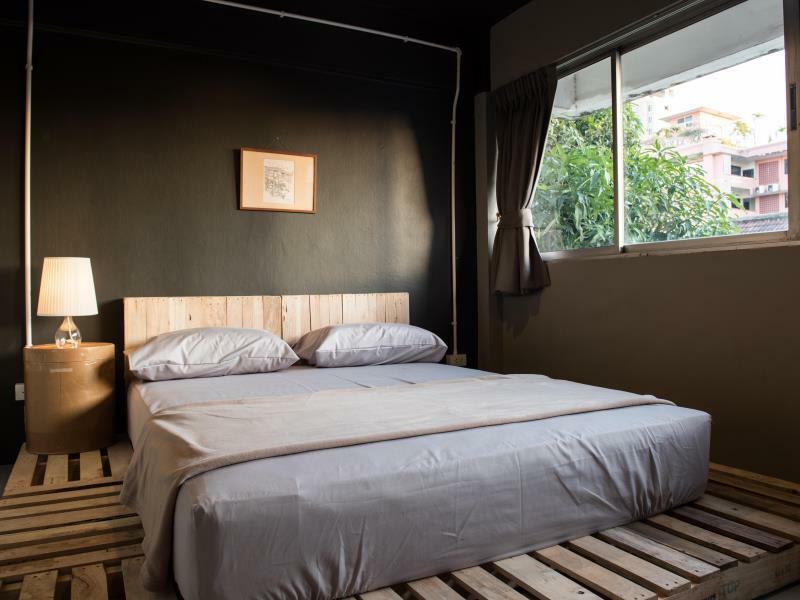 A Hostel is the best choice to stay when you arrived at Bangkok. 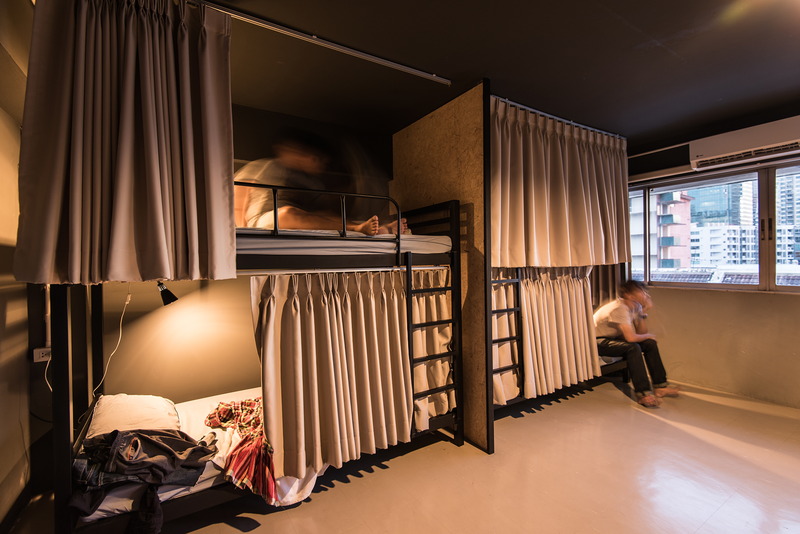 The building of the hostel has a modern interior and also unique. Really comfortable to see and stay, eventhough only one night. A Hostel is not too far to Chathucak weekend market. (+/- 15minutes walk) you can walk and enjoy the Bangkok City atmosphere. The staff is very helpful and also fluent in english, and there's a cute dog named Gapi (unique hostel rite?) The room is quite clean and the bathroom also. So if I have a chance to visit Bangkok again, I wont hesitate to choose A Hostel again and stay longer. I can't think of one negative thing to say about this place. The facilities were spotless, the bed comfortable. The bathrooms were nicer and cleaner than most I've seen in Thailand. The staff was very nice and even called me a taxi when I checked out. It felt more like a cool hipster hotel than a hostel. There are 7/11s in walking distance and it's less than a mile away from JJ Market. stayed for 2 nights at A'hostel. i am a big fan of KAPI, when i got hostel in a late night, kapi is there for me, feel like i m home with my dog too. 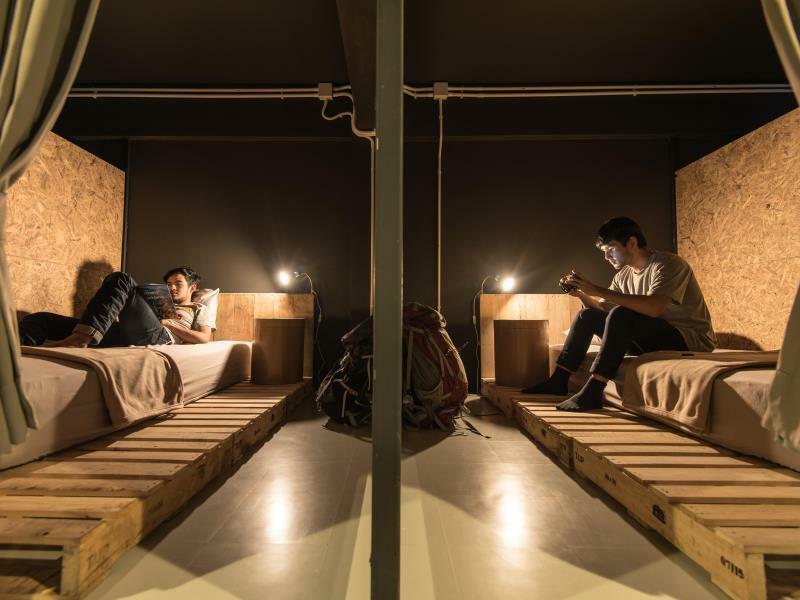 Private spot for a comfy sleep, clean hostel, helpful staff. I fell in love with Kapiiii !!!!!! The cutest dog ever! LOL..The place was really clean, chilly rooftop, and the drinks and food down at their lobby are nice. I was staying in mixed dorm. The dorm was spacious but there was no locker or any secure container for your belongings. I wasn't provided the towel as well. That's probably only downside I could point out. The hostel is a walking distance to Big C mall, and there are food stalls around. Very convenient! 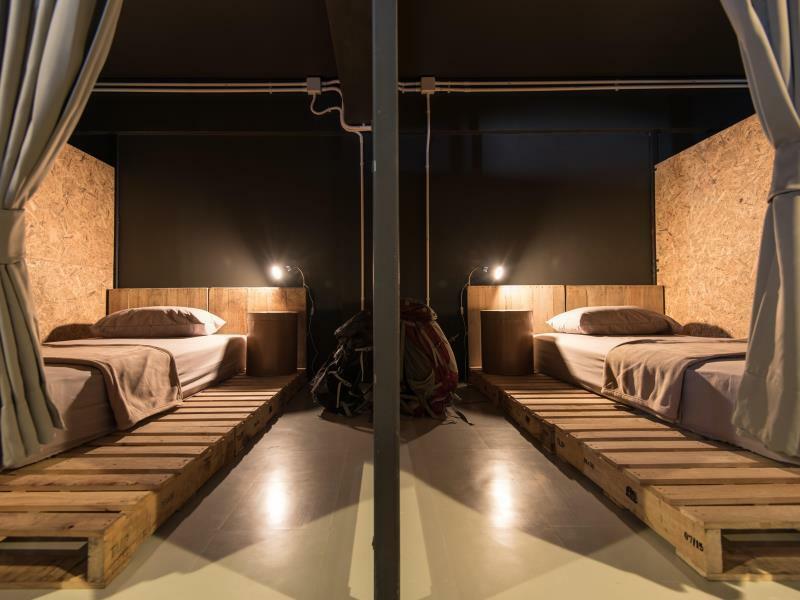 This hostel is unique in that each bed has its own personal space which is great. All of the beds in the female room are on the ground so if you hate top bunks this is the place for you. It is a little but tucked away but there was no problem finding it. Not a party place but nice and quite! 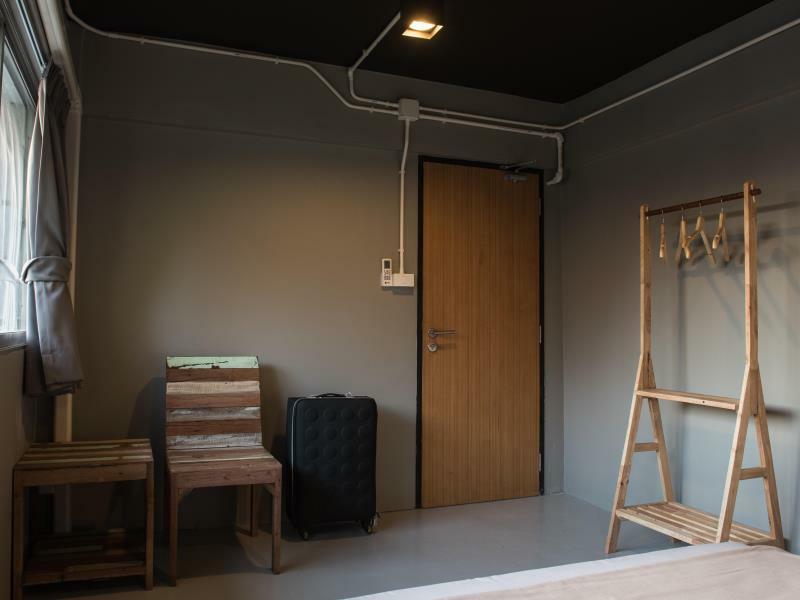 This is the new built hostel that located at nearby BTS saphan kwai. Within 20 minutes walking distance we can reach chatuchak market and Mo chit station. Outside the hostel have a lot of nice food stalls and thai's massage shops. The decoration of hostel is nice with industrial style, provide with free coffee, tea, drinking water, oven n has a small kitchen at the roof top. Will go back again next time. I love that the beds are separated from each other by a divider that goes 3/4 to the ceiling, and there is actually space for your stuff beside your bed. Shower excellent. Staff friendly and helpful beyond necessity. Amazing streetfood stalls on pradipat. It was good to visit sunday market. Facility was good. But the linen and was a bit dirty. I saw several black hair of previous guy there. And the room was quite dusty. Staff was really kind and helped me to have late check in. Very reasonable price compared what you get. This place not far from BTS, just take 7-10 minute walk. It ‘s good for people who like hard bed and pillow. But not comfort me because bed in room not strong. It has sound when I moved.Both bed and pillow are so hard. Very good location, close to BTS sky train. Plenty of street foods and resturants. Hostel is clean and has many types of rooms. Σταθμός BTS Saphan Khwai στα 0.61 χλμ.